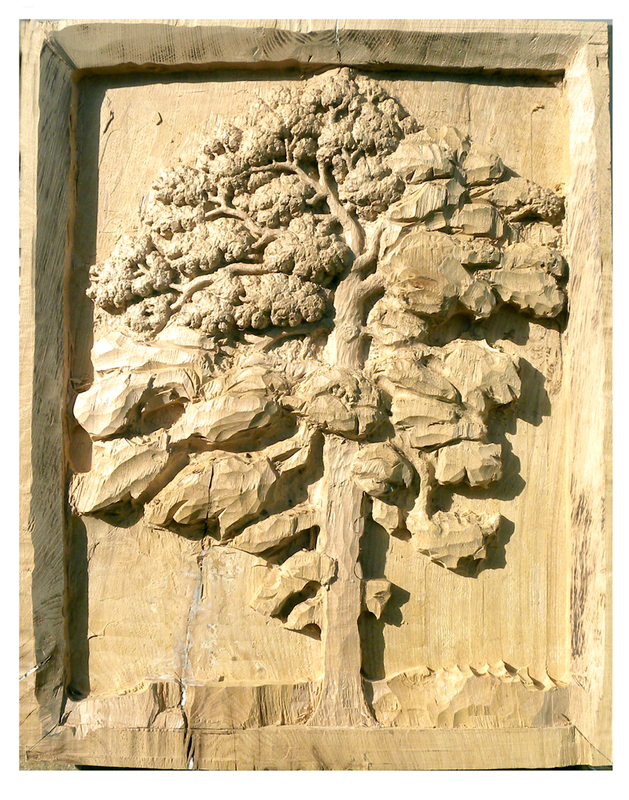 This is the latest installment from Terry Hardaker on his progress in carving a relief portrait of the OneOak tree in its own wood. Terry has had to deal with a large split that developed in the wood but nevertheless is making good progress. In this photograph taken in late June, it is possible to see some of the leafy canopy emerging in the carving. He will be working on the carving and demonstrating at Art in Action in July (read more). 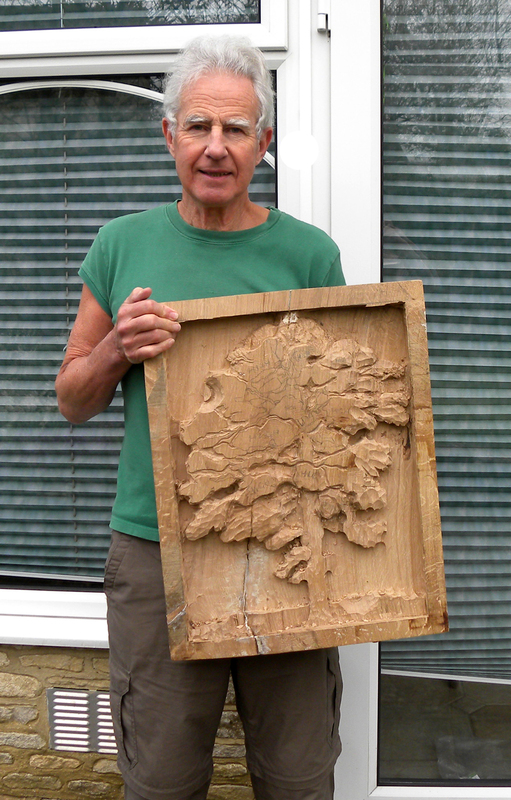 Terry Hardaker, artist and woodcarver, has started work on a relief carving on the OneOak tree made from the tree’s own wood. Terry is carving an image some 48 x 60cm in size, weighing 11 kilos, from one of the offcuts from a longer board used by a furniture maker. Terry works with traditional woodcarvers’ chisels but for this work he removed the ‘ground’ around the outline of the tree with a routing machine. He will still be working on the carving when he joins us at Art in Action in July (read more). Terry is a member of the Ox & Bucks Woodcarvers Association (see British Wood Carvers Association) whose members meet weekly near Oxford to work on their projects. He trained in portrait painting then spent 16 years in raising silver plate before joining the woodcarvers in 2004. Terry was invited to carve the OneOak tree and become part of the project having been ‘spotted’ at Art in Action in 2010. He says he has no room left at home to display woodcarvings and so accepts commissions to keep his eye in. He has designed and worked on historical themes for the 1000th anniversary of the formation of the county of Oxfordshire and the 450th anniversary of the granting of the Royal Charter to the city of Abingdon. A major milestone was reached in the OneOak project yesterday. The timber was removed from the drying kiln at Deep in Wood sawmill, and the Makers came to collect their boards. Makers present included Philip Koomen, Derek Elliot, Robert Ingham, Philip Clayden, Simon Clements, Martin Damen, Terry Hardaker, Pathway Workshop, and students from Rycotewood Furniture Centre (Oxford & Cherwell Valley College) led by Chris Hyde and Joseph Bray. These makers will be working mostly with the main sawn boards from the OneOak tree, and their products will join those already made by other makers from its branchwood and waste products. All Makers will now get underway in making a myriad of wooden objects from the OneOak tree’s timber, in readiness for our major exhibitions from Summer 2012. 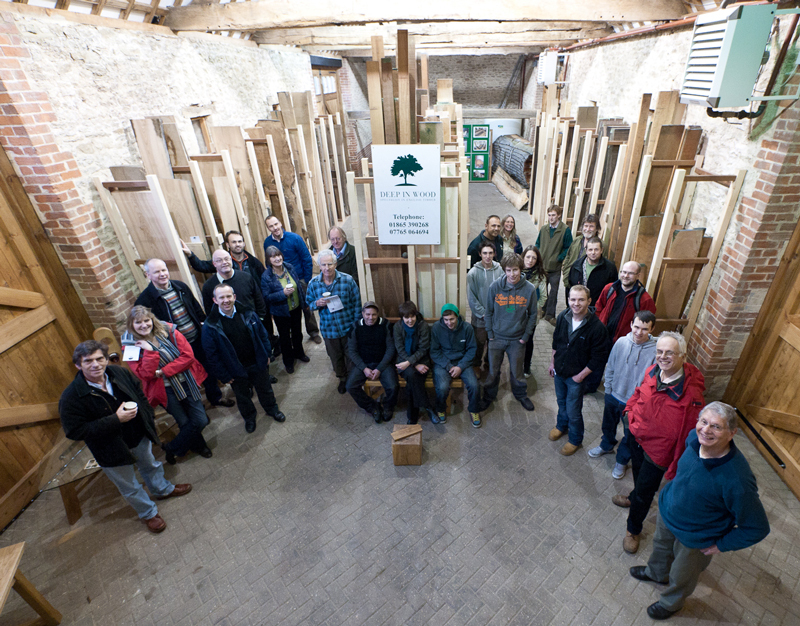 Our huge thanks to James Binning and team at Deep in Wood for hosting the event and for their generous support of the OneOak project over the last two years.